What a remarkable session on Thursday for the market, which saw all the major indices open under immense pressure, only to find their footing and rebound. There is no doubt that Apple which hit one trillion in market cap played a major role in whipping up general enthusiasm. Then there was the $5.0 billion apology from Elon Musk that helped propel Tesla (TSLA) to an amazing session in the process, crushing the naysayers and shorts. That one-two punch helped the tech sector outperform, and the NASDAQ-100 accelerated its move off a key support level. It was just a couple days after it had to hold above its 50-day moving average; and now, we could see the index test its all-time high in a few sessions. Stop guessing about the market or individual stock tops. Apple’s market cap was $5.0 billion in 2000. The value is up 199 times – think about that for a moment. If this is in your stock account or retirement account, you changed the economic trajectory for yourself and family. Share price isn’t value. Right now, Apple’s shares are changing hands at a forward price-to-earnings (P/E) ratio of 15.3, which is less than the average S&P 500 component. Management has bought back $43 billion in stocks this year, and I think it’s a smart investment. I get that Apple is a special company, but this is an old lesson on long-term investing. Pull up the chart of any publicly traded American company that’s one hundred years old and have long passed their own super-charged go-go days, and you’ll see that it has simply has evolved and see how well the shares have performed. There are a few Kodak’s out there that dropped the ball, but overwhelmingly, Great American companies remain great enough to reward shareholders. This is also something to consider when the market finally corrects, and you may be tempted to head for the hills. Millions of people that headed for the hills in March 2009 never returned to the stock market, even though most promised themselves they would. Now, a lot of them are sure they would buy the next dip. They won’t buy the next dip. The key is to have more cash but be careful not to panic with shares of Great American companies that probably go a lot higher over the ensuing years. Some are saying the great growth versus value debate is over because of the sudden snapback in Technology (TLX), but I think that’s a mistake. I continue to believe investors should be aiming for balanced portfolios, which includes both. In fact, the second best performing sector was Consumer Staples (XLP), even as many of those names have shown an inability to pass onto consumers. Still, a lot of bad news is baked into these names, which is why there will be a lot of consolidation. I think J.M. Smucker (SJM) is the cheapest name in the sector. With all the hoopla over Apple and Tesla and other things in the market, the biggest buy signal was the most benign. The Dow Jones Industrial Average was down more than 200 points, weighed by big names with big exposure to China; and yet, it staged a very convincing rally. I guarantee buyers of the dip were not small investors taking a shot, but the smart money is getting ahead of the crowds. The next upside test begins at 25,527, and a close above 25,709 would be the ultimate buy signal. As for the China situation, I found it intriguing. Out of the sixteen companies with the largest revenue exposure to China, only five were down yesterday, including Wynn Resorts (WYNN) and Las Vegas Sands (LVS). The latter said their earnings miss had nothing to do with tariffs or Trump’s hard line on Chinese trade despite being barraged by one reporter determined to make him say as much. Meanwhile, in addition to Apple and Tesla, other stocks with big China revenue exposure that surged yesterday include Perkin Elmer (PKI) and Lear Corporation (LEA). 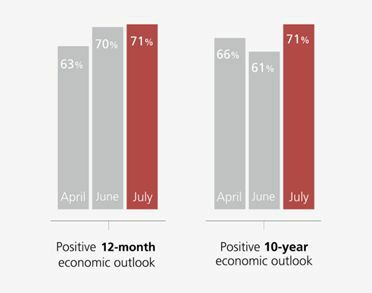 Speaking of China, I was shocked to see a poll from UBS on Business Confidence, which continues to improve. The results of this survey and the way the U.S. economy is holding up as other economies stumble is why we are hearing there could be a deal with Mexico soon, and China has returned to the negotiating table. This is the latest narrative being used to scare folks into not fighting back. That first quarter of Foreign Direct Investment (FDI) has declined dramatically in the last two years. It has, but this number can be very volatile, and the $51.0 billion in the first quarter is a lot more than most first quarters in the last ten years. Moreover, the number has been trending lower since peaking in 2015. There are numerous factors that influence these numbers, more than tariffs or fighting back against them, including a rush to buy American companies before the new administration and a stronger Committee on Foreign Investment in the United States (CIFUS). 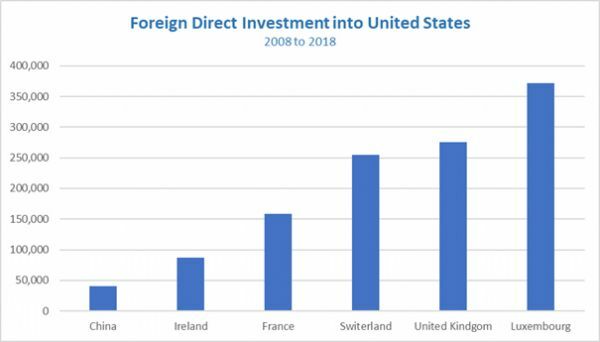 By the way, the notion that China is so great at returning American cash in the form of investments should be put into the context of investments from other countries - some with significantly smaller economies. In addition to the jobs report, the market is grappling with news out of China. There’s the announcement of tariffs of $60 billion in U.S. goods, but the more telling news is the attempt by the PBOC to slow the decline in the Yuan. Remember, China spent one trillion to keep the Yuan higher.